Thank you for choosing choosing Loch Leven Equine Pracice and giving your horse or pony the very best care. 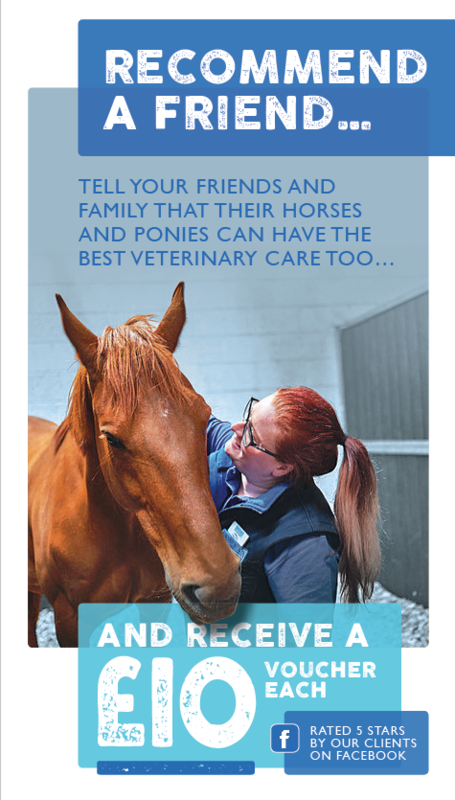 Your friends or family who haven’t yet used Loch Leven Equine Practice can do the same and as a thank you, both you and your friend will receive a £10 voucher which can be redeemed against any Loch Leven Equine Practice Service. Or if you would prefer, we can make a £10 donation to a charity of your choice. With 24/7 care from dedicated equine only vets with access to full surgical facilities and equipment, as well as low cost routine health care why not invite your friends and family to join us? Download and print out the form below and bring it along to your first appointment, pop into the clinic or post it back and our client care team will be delighted to allocated a £10 credit to your account. Your friend will also receive a £10 credit on their account as a thank you for recommending the practice.